Walter Stockmayer was an internationally known chemist who contributed to classified research during World War II. After the war he taught at MIT and then transferred to Dartmouth in 1961. Stockmayer was drawn to the area because of the college’s proximity to the White Mountains. He was a passionate hiker and lover of the outdoors. Sylvia Stockmayer was an avid gardener. 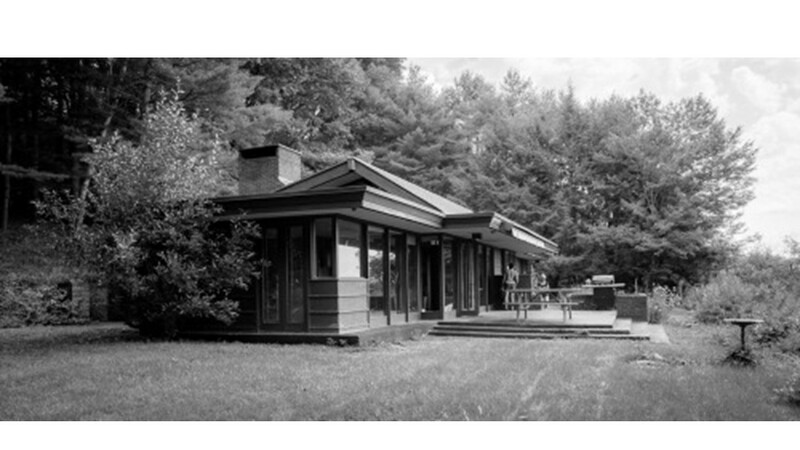 The Stockmayer’s had strong opinions about the design of their Norwich house, wishing to have a home as a “work of art in harmony with the magnificence of their surroundings.” Their friend Lucille Zimmerman, who lived in the first New England Usonian home to be designed by Frank Lloyd Wright in Manchester, NH, recommended Wright’s apprentice, Allan Gelbin. Interior of Gelbin’s Stockmayer house on the left; Frank Lloyd Wright’s Zimmerman house on the right. The house was set into the carved-out hillside on the north, providing protection from the elements. It rests on a concrete slab, “integrally colored terracotta red”; it is heated from warmed copper coils below the slab. Brick was combined with cypress wood within and without. Gelbin was proud of the passive solar strategy integrated into the design. Plan of the Stockmayer house designed by Allan Gelbin.